January 09 - A quiet month, absorbed by work for both of us. We did manage to utilise our weekends to the full whatever the weather. We had a couple of opportunities to cut some willow trees on a local farmers land and this helped us to replenish our log pile. Willow is a very wet wood and when it is seasoned it spits a lot so it's just as well we have a wood burner so that any spitting is contained within the fire. On the first of January we went for a walk from home to Graham and Sue's into town along the Northampton Arm of the Grand Union canal. 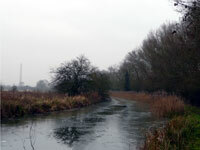 It was a really good walk despite the cold and as can be seen from the photo the canal was frozen over. Our round trip walk took us a total of 3 hours and we spotted a kingfisher as we walked the canal. We haven't seen a kingfisher for several years but this is largely due to the fact that we spend less time walking now than we used to. Also there were a number of fieldfares which are winter visitors. At this time of year there are some really great lights and Jane has an eye for the right moment. 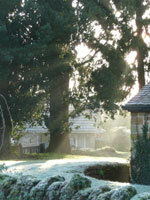 The image here was taken in the church yard opposite the house with the sunlight streaming through the pine trees on a very frosted grass and ivy clad wall. Jane's friend Alison hit her 70th birthday this month. Jane really could not believe she was this age. Alison is the archetypal 70 who seems more like she is 60. The doctors at Blisworth always say that older people today are 10 years fitter than our predecessors. 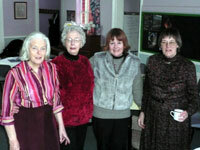 A celebratory Tea party was held in the Church hall in Greens Norton to celebrate this momentous occasion. 30 female friends had an excellent afternoon together sharing our thoughts and experiences. Jane was pleased to be asked to provide the drinks for the party goers (tea or coffee), she always likes to be useful at these occasions. 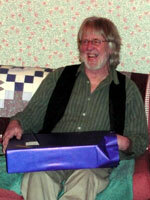 The momentous event of the month was Graham's 60th birthday. On the Friday before the usual suspects met up at the Malt Shovel for a surprise drink. 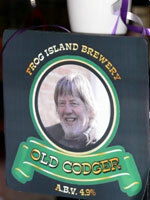 Sue had arranged for a special pump clip call Old Codger to be produced with Graham's favourite Frog Island brew. He was really surprised by the number of friends who turned up to share a drink and raise a glass of his own brewed NatterJack from the Frog Island brewery. Graham's 60th birthday party was held at his home and it was filled with his friends, old and new. Sue created a feast so there was plenty of food and drink, enough for everyone. As can be seen from this picture he had a really great evening and was really surprised to receive a Humax PVR recorder from the usual suspects. This was purchased because he had expressed annoyance about not being able to record digital programmes and watch another channel. Graham is not enamoured with technology so it was great to see him taking pleasure from it.